The case for the Big Band Live CD. 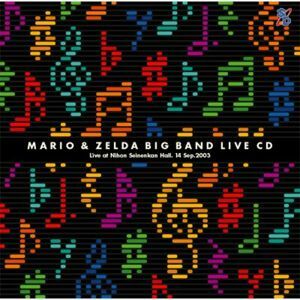 Mario & Zelda Big Band Live CD is a recording of various pieces of music from two concerts held on September 14, 2003 at Nihon Seinenkan Hall in Tokyo, Japan. A DVD recording of the event was bundled with Nintendo Dreams Volume 101, a gaming magazine. Mario & Zelda Big Band Live opened with Ashura Benimaru Ito playing the Super Mario Bros. theme and the Underground theme on guitar, followed by the Big Band of Rogues and Yoshihiro Arita with his band. This page was last edited on April 29, 2017, at 04:15.